Hey Coffeeholics! June is here which signals that we are halfway through with the year. 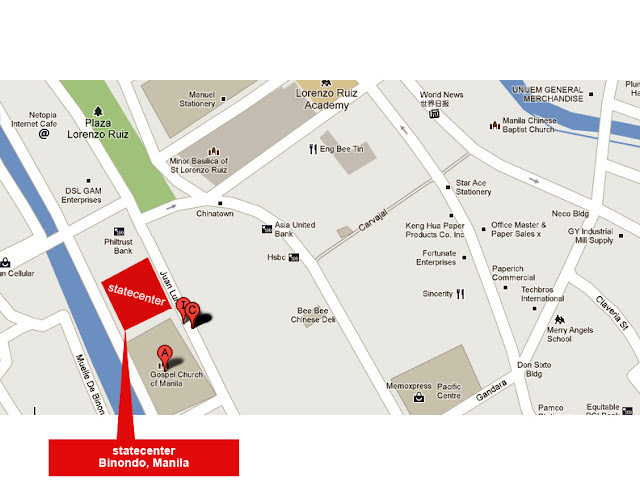 So let's celebrate by going to MCT Events Management's 4th BINONDO WAREHOUSE SALE on June 10-16, 2013 at the State Center Investment Building, along Juan Luna St., and across the St. Lorenzo Ruiz Church. The annual event at the heart of Binondo district attracts thousands of shoppers in one of the most viable markets in Metro Manila. The fourth BINONDO WAREHOUSE SALE is a seven-day event that showcases different brands that hold their mid-year Sale. 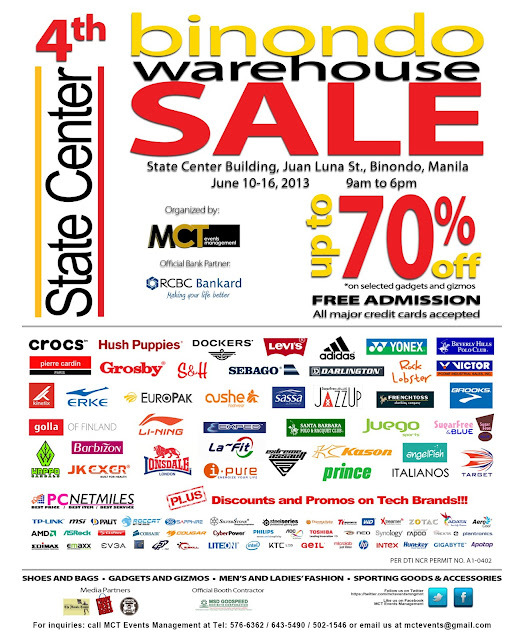 Shoppers will enjoy amazing price cuts, by up to 70% discount, on shoes, bags, men's & ladies' fashion, sporting goods and accessories, personal care, computer parts & accessories of leading brands. 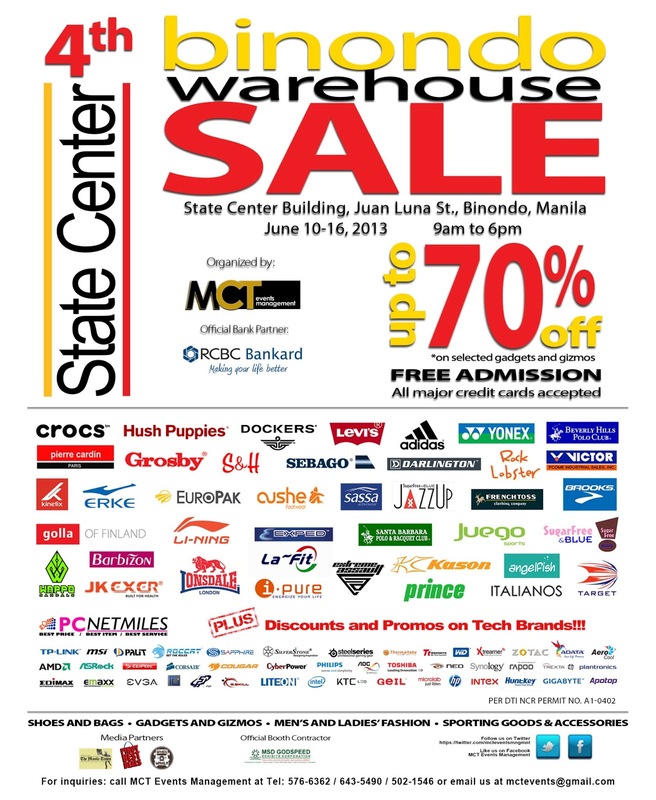 New brand participants like Adidas, Brooks, Prince, Yonex, Li-ning, PC Net Miles, and the usual exhibitors (Levi's & Dockers, Hush Puppies, Sebago, Europak, Victor and New Barbizon) will surely delight the shoppers with their offerings and promos. Shop HERE at Statecenter, Binondo, Manila! Media partners: The Manila Times, Business Mirror, Philippine Graphic, PinoyBestDeals.com, ManilaReviews.com, WhenInManila.com, and Brew of The Day (www.kaisensei.blogspot.com). For more information about the event, call MCT Events Management at 502-1546 or 399-2935. You may also follow MCT through Facebook Fanpage: www.facebook.com/MCT-Events-Management or in twitter: @mcteventsmngmnt for more updates on this event.